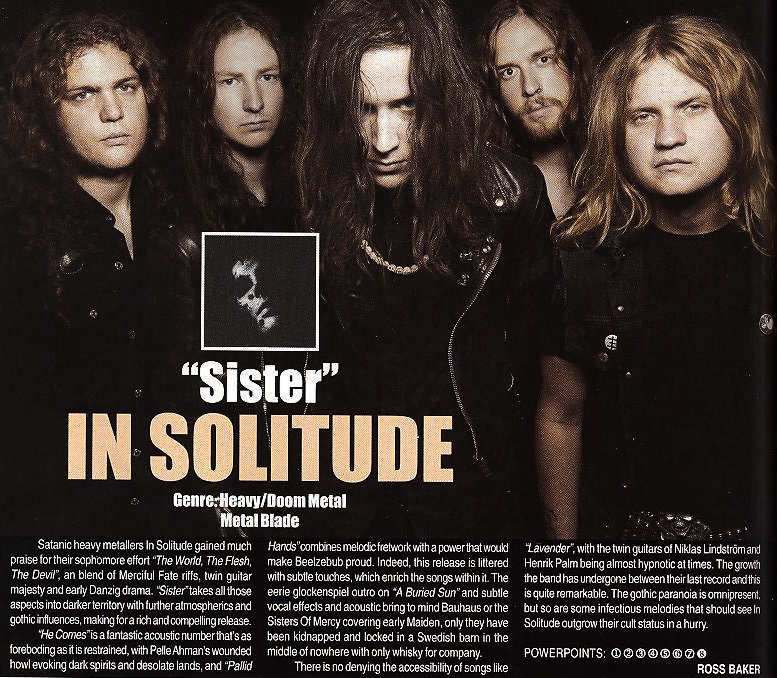 Satanic heavy metallers In Solitude gained much praise for their sophomore effort “The World, The Flesh, The Devil”, a blend of Merciful Fate riffs, twin guitar majesty and early Danzig drama. “Sister” takes all those aspects into darker territory with further atmospherics and gothic influences making for a rich and compelling release. “He Comes” is a fantastic acoustic number, as foreboding as it is restrained, with Pelle Åhman’s wounded howl evoking dark spirits and desolate lands and “Pallid Hands” combines melodic fretwork with a power that would make Beelzebub proud.Indeed this release is littered with subtle touches, which enrich the songs within it. The eerie glockenspiel outro on “A Buried Sun” and subtle vocal effects and acoustics bring to mind Bauhaus or the Sisters Of Mercy covering early Maiden only they have been kidnapped and locked in a Swedish barn in the middle of nowhere with only whisky for company. There is no denying the accessibility of songs like “Lavender” with the twin guitars of Niklas Lindström and Henrik Palm almost hypnotic at times. The change the band has undergone between their last record and this is quite remarkable. The gothic paranoia is omnipresent yet so are some infectious melodies that should see In Solitude outgrow their “cult” status in a hurry. Witchery and wickedness with a more seductive voice than most “Sister” is a dish worth savouring.